What's in a patch? 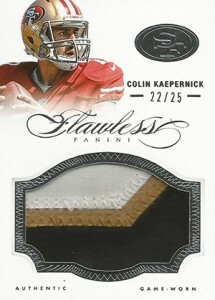 Some collectors were putting their detective skills to work and pointed out that some "game-used" cards in 2014 Panini Flawless Football, a product that tops well over $1,000 per single-pack box, might not match the label. Panini has acknowledged the problem. They've confirmed that some of the patch cards are from event-worn (photo shoot) jerseys and not game-used pieces as they were labelled. 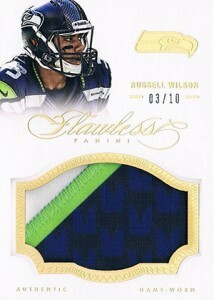 First confirmed were patch cards for Russell Wilson, Colin Kaepernick and Alshon Jeffery. This includes all versions of the Patches cards, including parallels. According to the card maker, autographed patch cards were affected by the error. Panini also said they are currently investigating Terrel Davis and Tajh Boyd cards that appear to have swatches from the wrong team. Collectors possessing any of the mislabeled 2014 Flawless Football cards mentioned above are encouraged to contact Panini America Customer Service via email at hobby411@paniniamerica.net. Panini America officials have thoroughly evaluated the situation to identify three possible solutions to address the issue with consumers holding these cards: Buying the impacted cards back from consumers, offering consumers a replacement of equal or greater value or, if possible, rebuilding the cards with game-worn memorabilia. Company officials also will pay to have impacted cards returned to Panini America via USPS or FedEx. A full statement from Panini's CEO, Mark Warsop, has also been posted on their blog. In light of this and increasingly vague language about where the memorabilia on a lot of cards (from all companies) come from, do you fully trust relic cards? What do you think could be done to make them better? Feel free to discuss in the comments below. 2014 Panini Flawless Jerry Rice #rd 13 15; AUTO; Game Worn Swatch! The whole jersey/relic experience has become passe. Many of use remember when getting a piece of 1 color relic was a big deal. Big (relative) money was paid for them. Now we find issues, 2014 Totally Certified and Limited football, having relic and auto/relic cards #d to 25 with single color relics. Bogus practise. Then, there are the ones where a patch from a previous team is put on a player’s new team card. Happened to me last hockey issue of Tot. Cert. I don’t know what the answer is to the patch/relic game. They are clearly superfluous now unless you have a card from a product like Flawless and, oh yeah, you can’t trust where the patch came from. One easy answer to these problems; stop with glut of products. It’s insane and a ripoff. Their blog states this:GREATER value. Collectors possessing any of the affected cards can exchange them for cards of equal or greater value.But anyways.A product like this with a very high price point they should be going over these cards with a fine tooth comb.